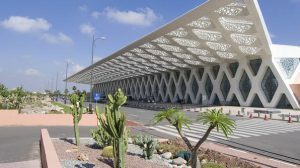 Morocco is a country of contrasts, characterized by the diversity of its culture, its history, its architecture and its countryside. The south of Morocco contains all these aspects. 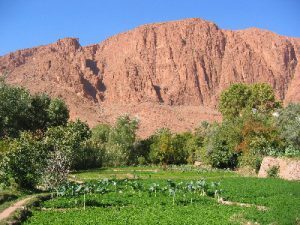 The contrast between the arid mountains and the fertile valleys, the gorges, the dunes, in combination with the Berber culture solidly rooted in the history of Morocco. Arrival in Marrakech. You will meet up with the guide who will assist you during the tour. Dinner and stay will be at the hotel. After breakfast, we will leave for Ouarzazate, travelling over the Tizi’n Tichka pass, with its 2260 metres the highest pass in Morocco. 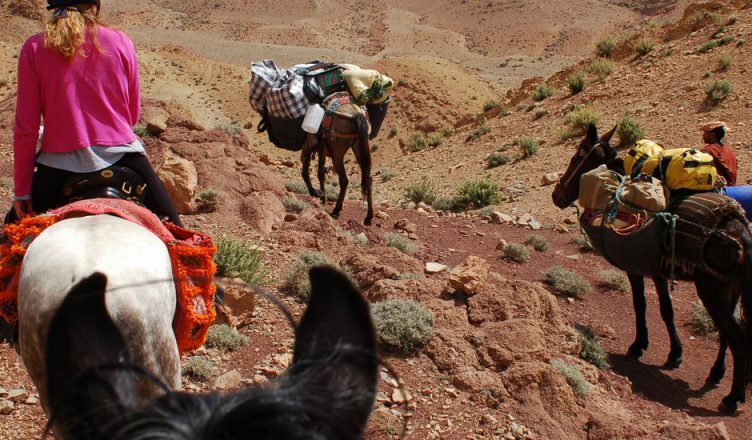 We’ll continue our way past the Berber villages of the High Atlas and the famous troglodyte settlements seemingly plastered against the mountain flanks. 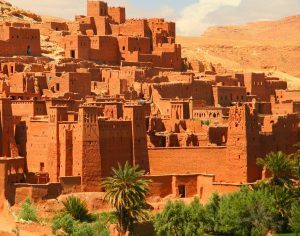 In Ait Ben Haddou we’ll have lunch and visit the famous UNESCO site where many films were made, like ‘the Gladiator’, ‘Jewel of the Nile’, etc. After leaving Ait Ben Haddou behind us, we’ll arrive at the Kasbah of Tifoultout, where we’ll have tea with some inhabitants. After that we will visit the kasbah Taourirt, the former residence of the Glaoui pacha during the French protectorate. In Ouarzazate we’ll install ourselves in the hotel where we will have dinner and stay the night. After breakfast we’ll depart in the direction of Tinghir, the ‘route of the thousand kasbahs‘. We’ll pass through the rose valley, crossing several beautiful valleys like the valley of Skoura and the valley of Kelaa M’Gouna, where every year in May the rose festival takes place. 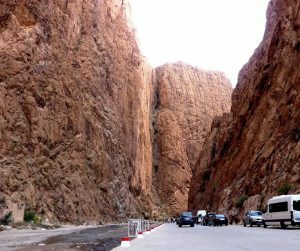 We’ll continue towards the Todra gorge, where rocks of 300 metres high rise up. We’ll have lunch in the gorge and after that you will be free to walk in the gorge. Departure will be in the afternoon, to continue towards Tinghir, the administrative centre of the region of Ait Atta, to our final destination of the day, Tizgi, a small village in the heart of the Todra gorges, where we’ll have dinner and stay the night in the hotel. After breakfast, we will discover the region on horseback. We’ll leave for the day into the valley with its palm trees, villages and more gorges. 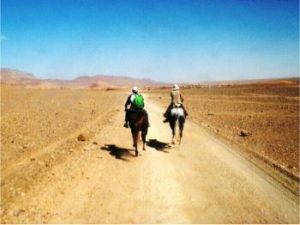 We’ll walk through oases and the hearts of traditional Berber villages. Lunch will be held with a family where we will experience the way of life of the inhabitants of the region. After that, we will return to the auberge where we will have dinner and stay the night. After breakfast, we will have our second day trekking the nicest saghro mountains to discover the region. Dinner and stay will be in the same auberge. After breakfast we will head back in the direction of Marrakech. Lunch will be had in Ouarzatate, after which we will continue to Marrakech. After arrival, we’ll install ourselves in the hotel where we will have dinner and stay the night. Afters breakfast, we will depart for a historic visit of Marrakech. Founded in 1062, it is the second imperial city after Fès. We’ll visit the Koutoubia mosque, which dominates the pink city, old earth coloured palaces and the palm tree garden of Marrakech. We’ll also visit the Saadian tombs and the Bahia palace, the residence of the grand vizier Ba Ahmad in the 19th century. We’ll visit the Jemaa el Fna square, the vibrant heart of Marrakech, and the souks with their infinite colours of the ancient medina. We will pass the blacksmiths, the dyers, the merchant in natural leather and spices that give off millions of different smells, the merchants and workers in wood, the makers and vendors of traditional outfits. Dinner and stay in the hotel. After breakfast, there will be free time until the transfer to the airport.